Increasing the amount of natural light in your room can be as easy as 1-2-3. If you think punching a hole in your wall to create a new window is the only solution, then you’re in luck. Let the sunshine in and have it bounce off glossy reflective surfaces like decorative mirrors and glass frames, even matte-painted flat walls. A large sized mirror placed in front of a window can do so much wonders, you will be kicking yourself for not doing it sooner. Whether hanged, in groups of smaller ones, or with a stand, it will surely help in bouncing the lights off and brightening even the dark corners of the room. Trees and bushes can sometimes block lights coming in. Schedule a monthly or bi-annual leaves trimming session. Also, be mindful where you plant your trees in the garden. To avoid the trees shading your interior during summer, plant in the Northern side of the home. But if you need the warm sun during winter, best to plant trees in the Southern section. One practical way to instantly brighten your interior is by cleaning your windows. It will make a big difference on how much sunlight passes through it. Remove the frosted sticker in the glass (if you have any), dirt, dust, and splatters to let more of the much-needed light pass through. 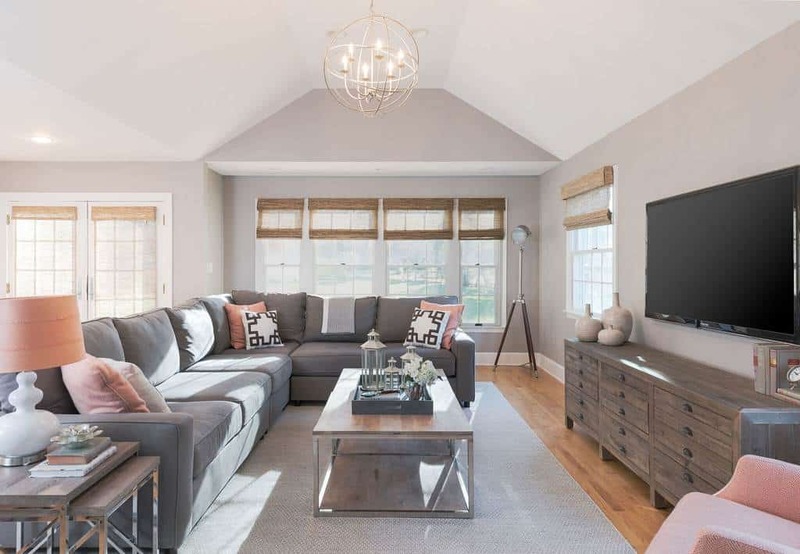 So you can imagine the possibility of what natural lighting can do to your interiors, let some of these absolutely adorable family rooms enlighten your mind. A rustic fireplace serves as a focal point for this contemporary apartment featuring a fabric covered armchair, white sofa, and grey tufted coffee table that also doubles as an ottoman. 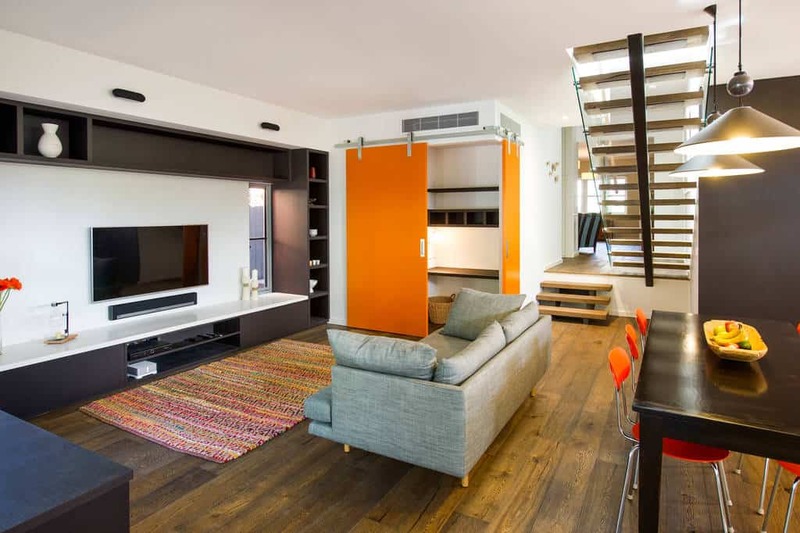 The bright orange sliding door of this interior is a surprise element that adds visual interest to its overall look. 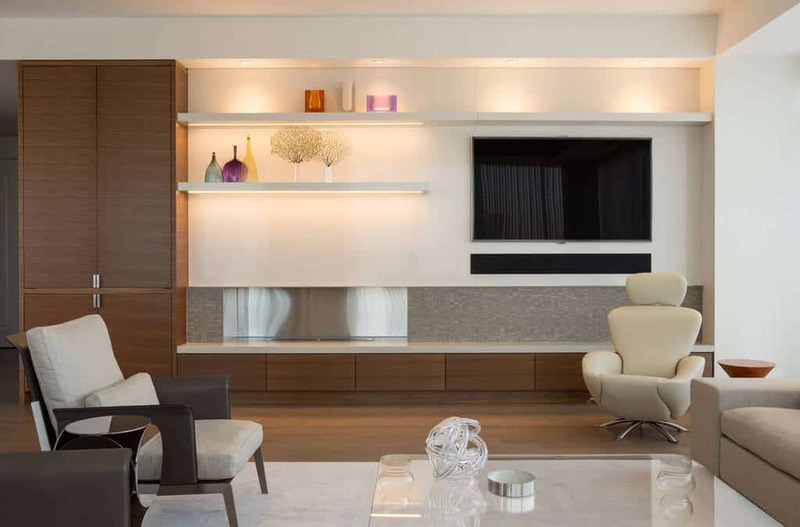 A slim room consisting of a tufted armchair, lounge chair, and a slender wood sideboard completes a TV viewing area. 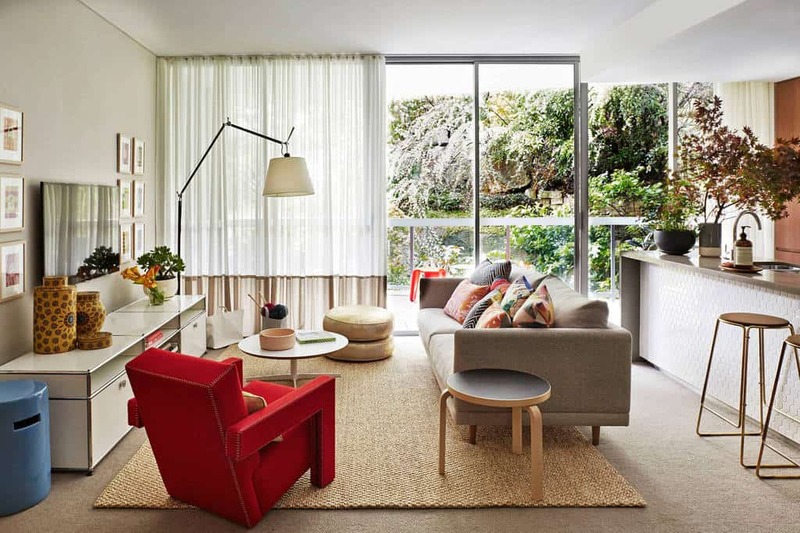 A red mid-century Utrecht chair gives this contemporary room a coveted second look. 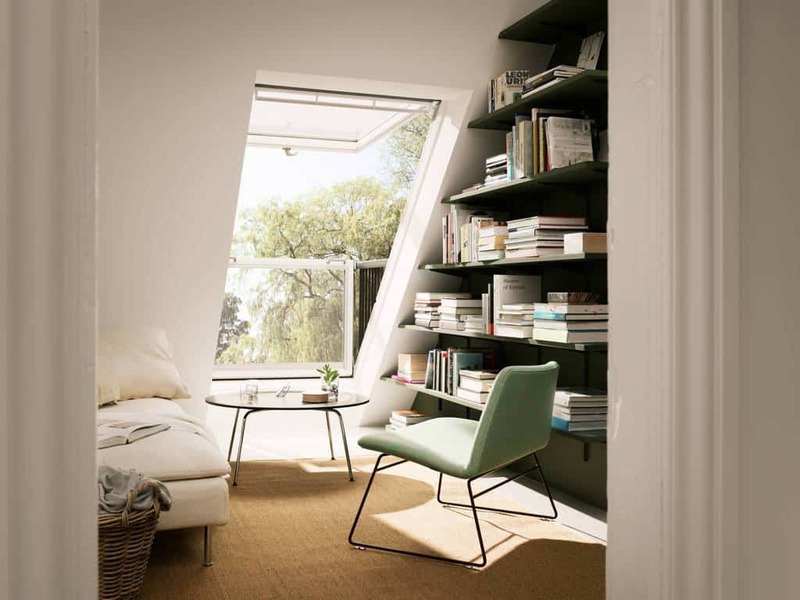 Clear glass window that turns into an instant balcony helps expand this charming library in the attic. 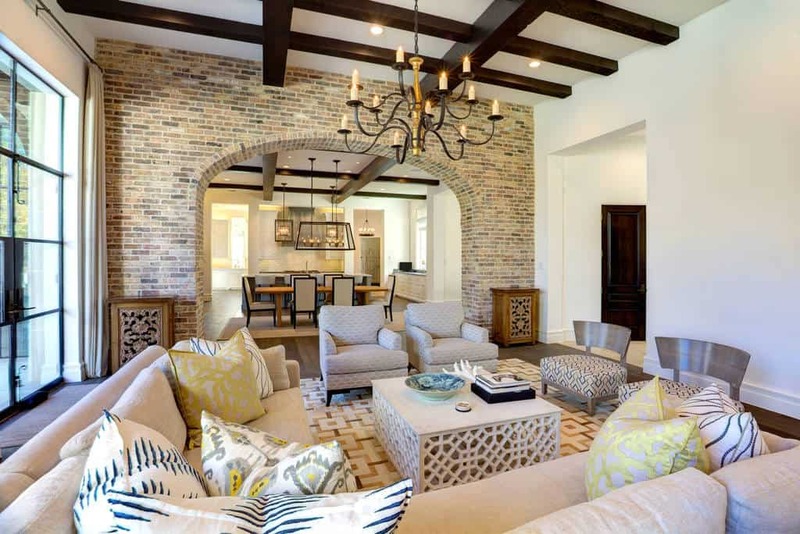 A brick covered archway visually divided the dining and living room of this fabulously eclectic homestead. 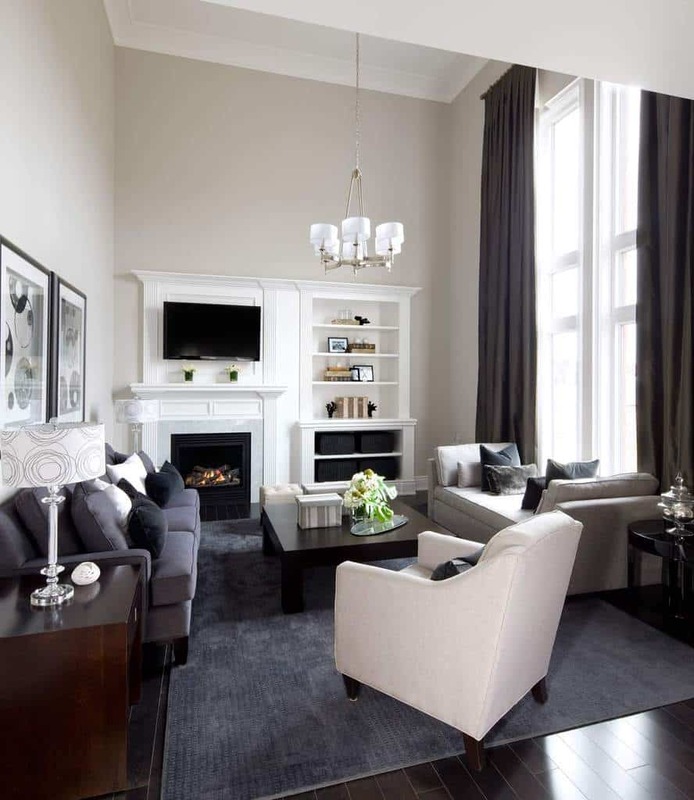 Understated glamour is visible in this sophisticated black and white interior with the deep gray fabric sofa, cream armchair, and a contemporary gray divan by the window. 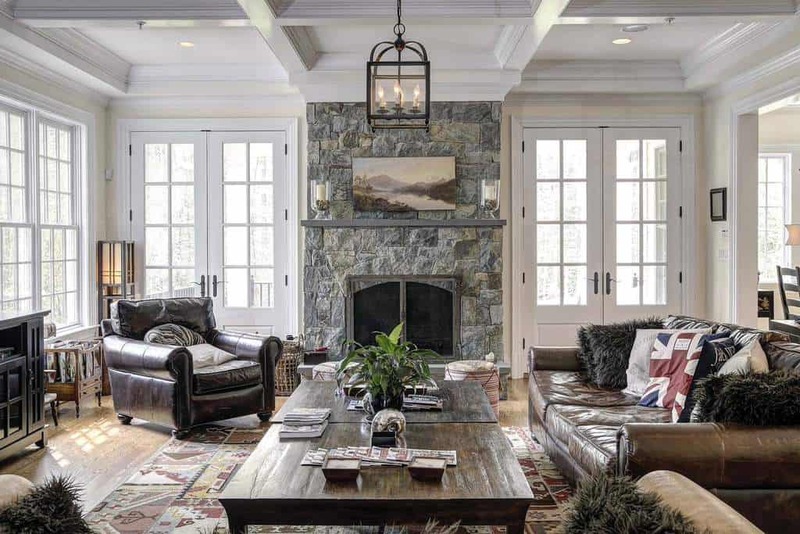 A vaulted ceiling with exposed beams all painted white serves as a backdrop for the multitude of contemporary pieces, like a leather sofa, industrial coffee table, and a chest as additional handy storage. Crisp all-white interior and a set of all white furniture including an ultra modern Barcelona Chair and Ottoman helps afloat the hardwood floors of this modest dwelling. The rustic themed interior can give you all the feels. 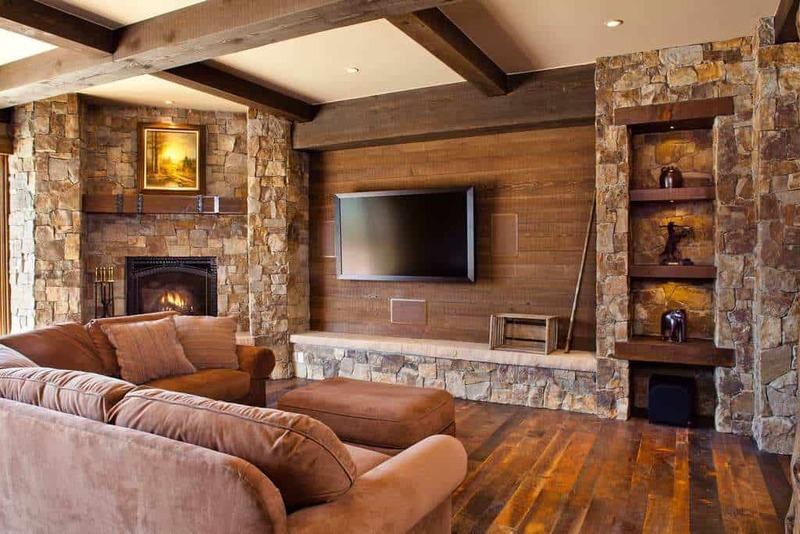 Here, a warm hardwood floor supplements the stone textured facade of the fireplace that extends to the built-in display shelves. 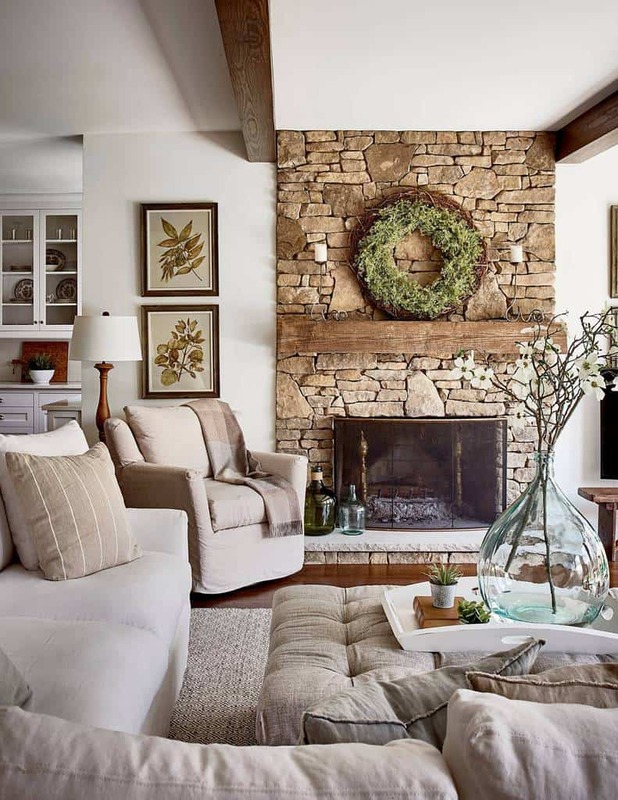 Textured fireplace covered in bricks anchors the all-white walls of this interior to its hardwood floor. A China cabinet acts as a stand-in for displaying memorabilia in this gabled roof house. 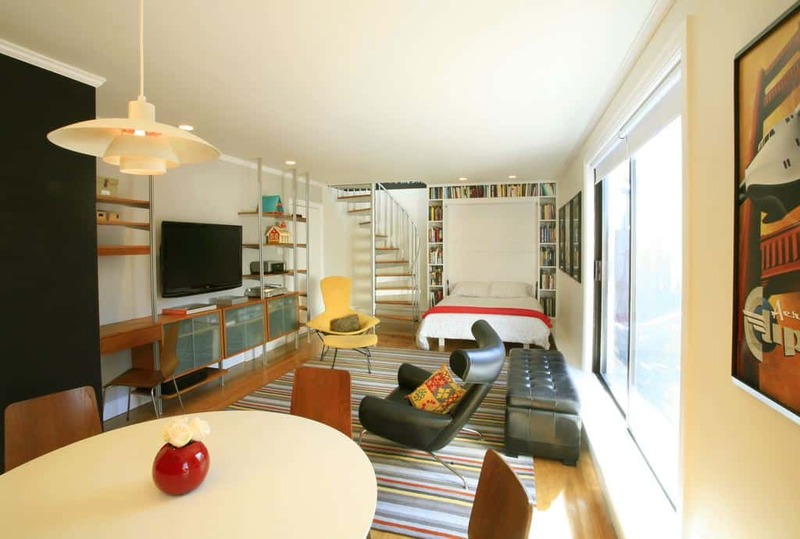 The writing desk in the corner and the blue pillow accent lends a touch of personality to the place. 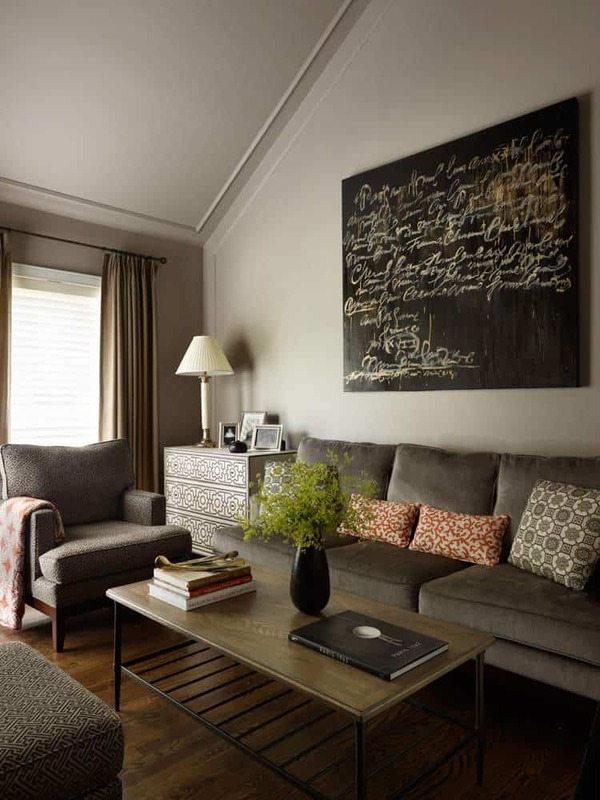 The reclaimed wood of the coffee table is a clear stand out in the interior of this home that features a gray plastered wall, wall-to-wall carpeting, and green classic sofa. This studio apartment has everything you need: a bed surrounded by books, a tufted leather bench, TV, dining set, and a swag Wegner Ox chair in black leather. 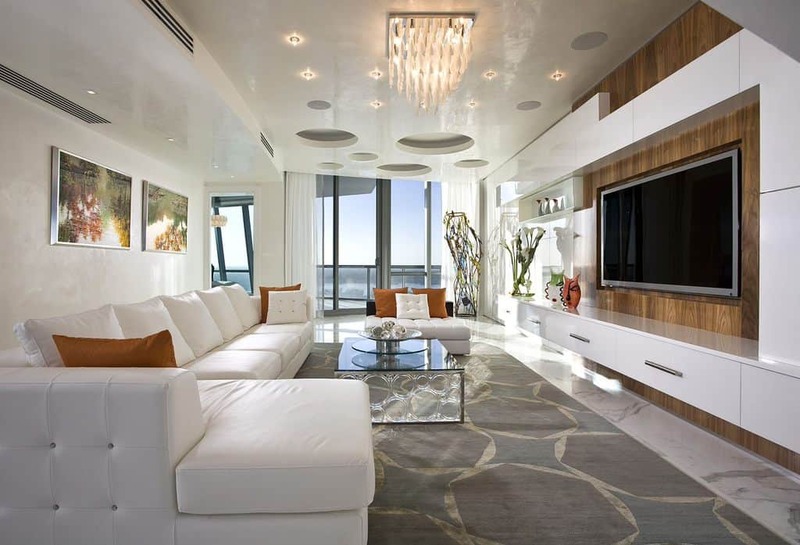 An interior befitting for a yacht, this all-white interior including a white marble flooring is fitted with a tufted leather sectional sofa and an oak back wall accent that houses a flat-screen TV. 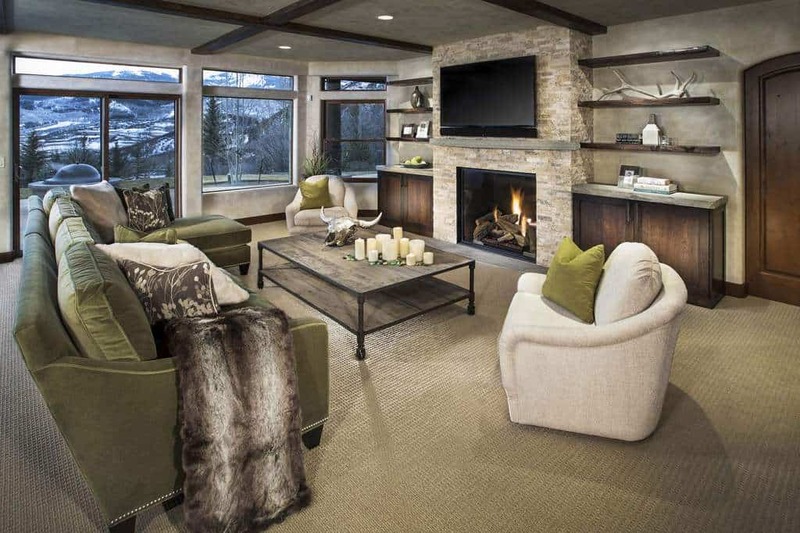 High ceiling dwellings can take advantage of the opportunity to showcase a collection of artworks. 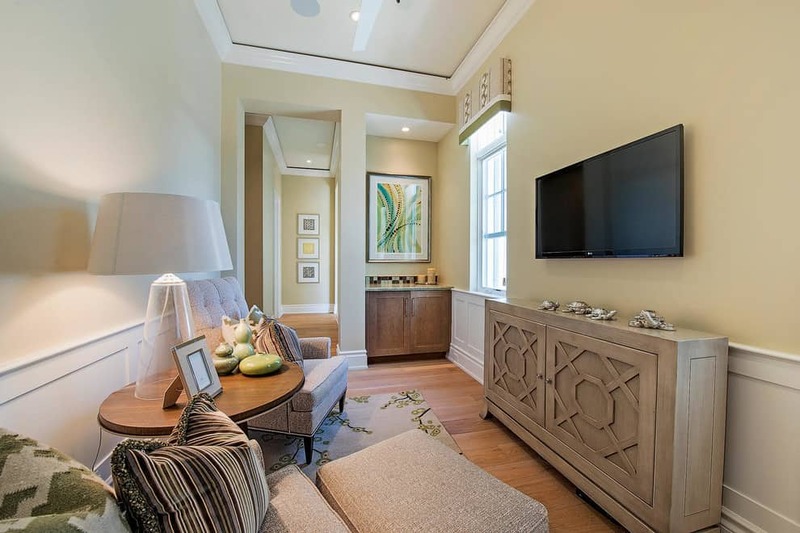 Upholstered armchairs with organic pattern connect with the wooden accent chairs and the architrave in the ceiling. 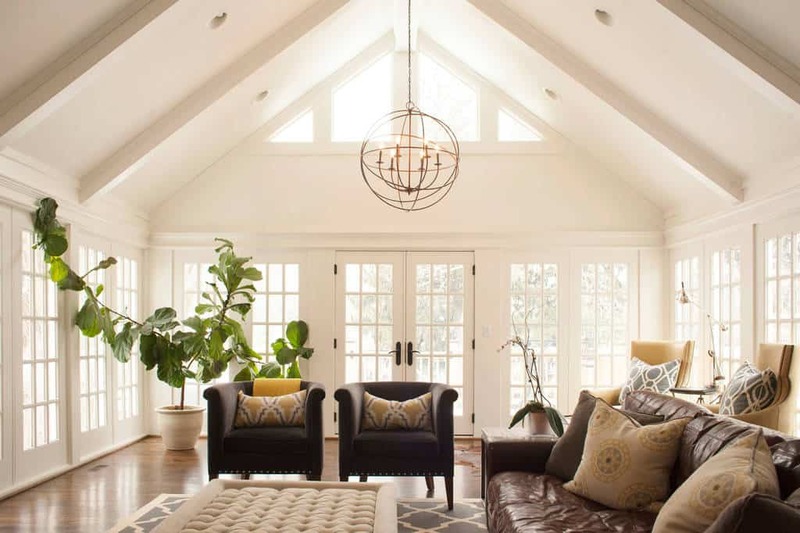 Natural light and soft shadows help forms a dramatic picture in this modern gabled house. Comfortable furniture together with the plants completes the setting. 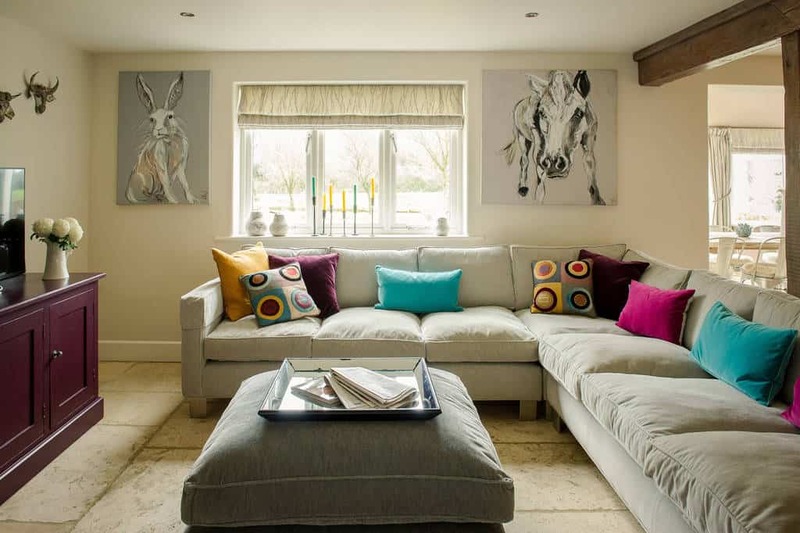 Frameless hand-drawn animal artworks and colorful pillows bestow a playful personality in this low-ceiling sitting area. 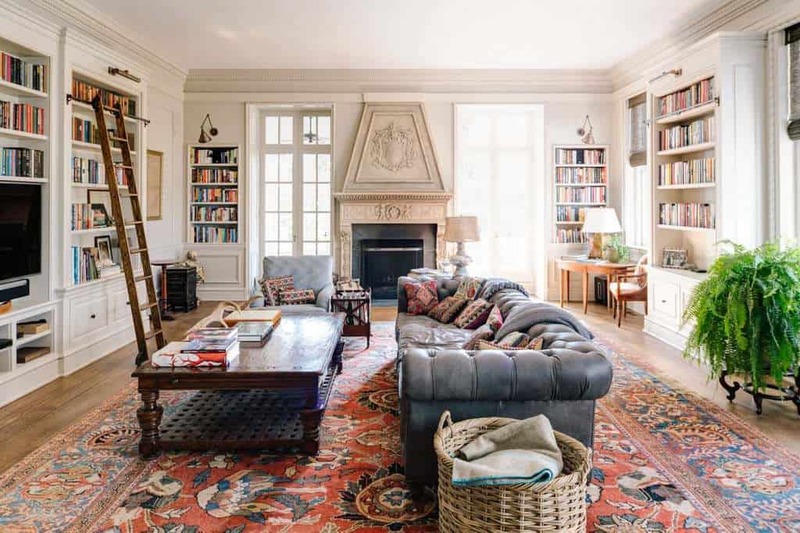 Photo by Martin Horn, Inc.
Gray Chesterfield sofa commands the interior of this spacious library with a classically designed fireplace and colorful Persian rug. Pull together a look simply by coordinating the fabric used in the curtain and let it appear in the accent pillow in a group of off-white armchairs surrounding a woven abaca coffee table. 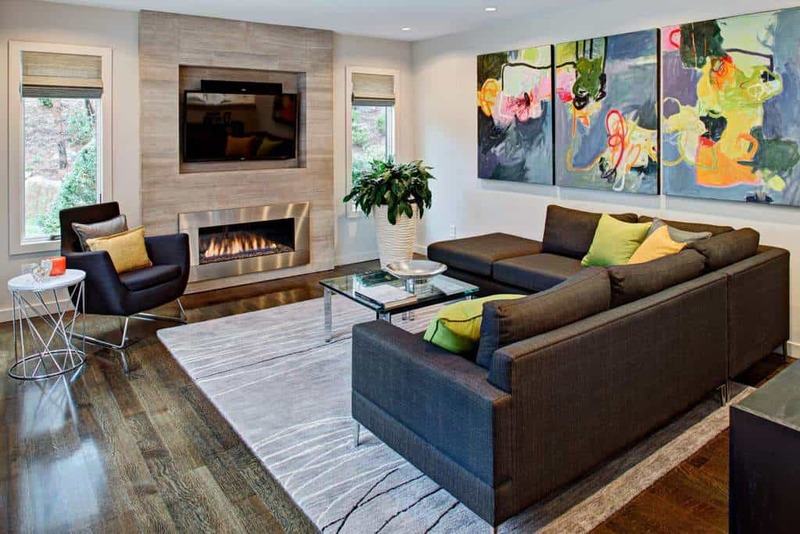 Despite the minimal architectural aesthetic, this residence is packed with style thanks to the shiny hardwood flooring, deep blue armchair, gray sectional sofa, and not to mention the colorful artworks of green and orange. 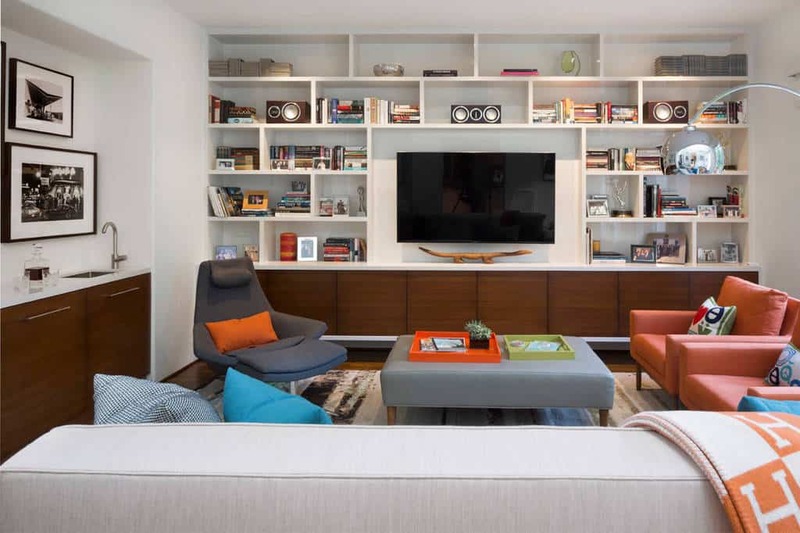 Photo by Norman Design Group, Inc.
A very utilitarian bookshelf serves as the unsung hero of this colorful apartment and the Metropolitan Chair and Ottoman by B&B Italia prides itself as the leader of the lack. 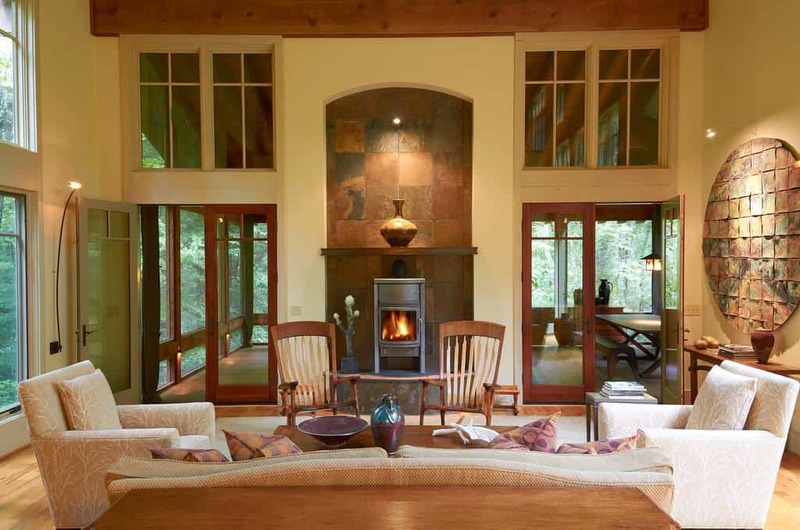 A cabin with a stained wood interior including the ceiling and flooring is visually divided by a massive wall of brick stone to create an illusion of another dimension. The almost black brick facade of this modern fireplace extends to the black wood built-in shelves on both of its sides and paved the way for the wonderful collection of vintage silver gas lamps. For a cool and pleasing interior, try painting powdered blue paint on the walls and glossy white paint on the architectural detailing. This will help set the scene for accents like teal and yellow. 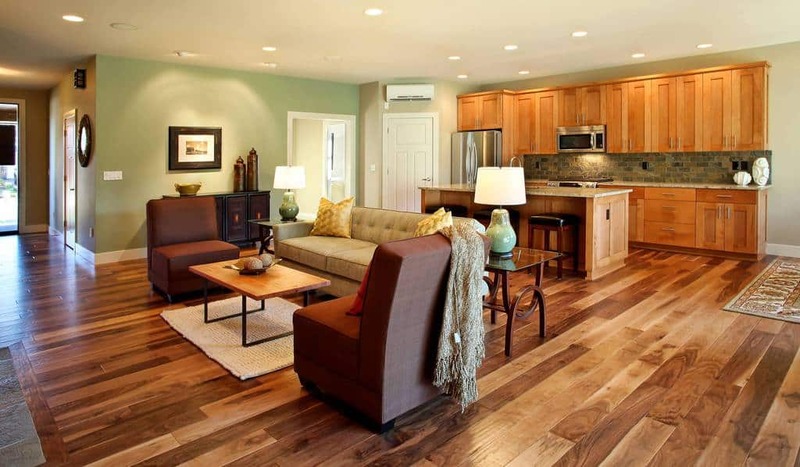 If you already have hardwood floors installed, that means you’re halfway to having a warm, cozy interior. Add a splash of green paint to any wall to create an accent. One tip in using dark colored furniture to avoid the room being gloomy is to shower it with personality. Seen here, orange organic pattern in the accent pillow, handwritten artwork, and a vintage chest of drawers. 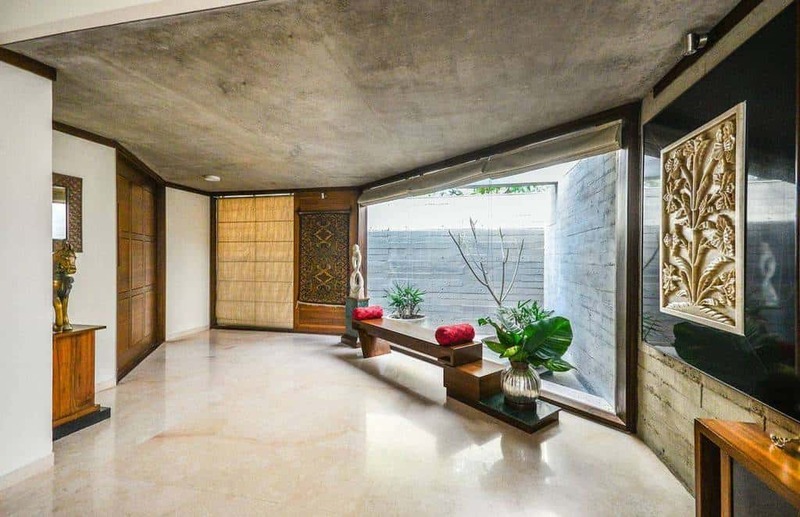 Hide unsightly beams through symmetry. 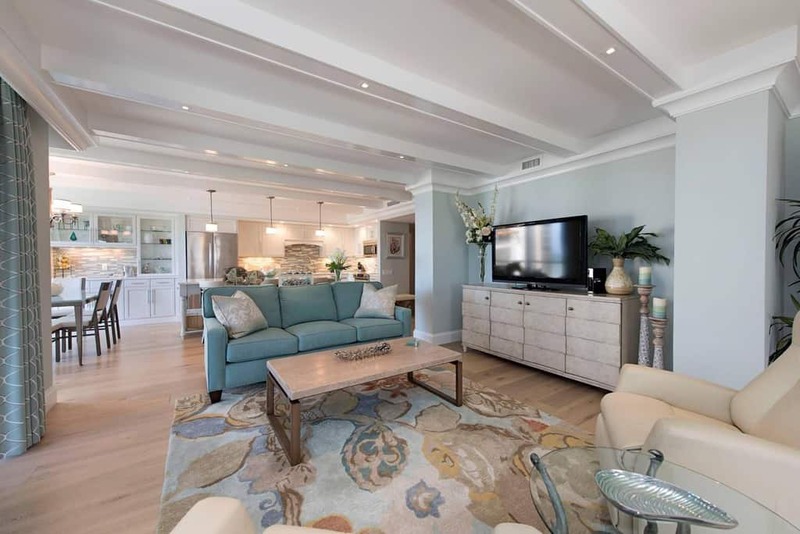 The coffee colored walls harmonize together with the sand colored carpet and brown sofas. The nautical theme of the carpet and classic armchairs of this interior pairs off nicely with the red brick facade of the fireplace. 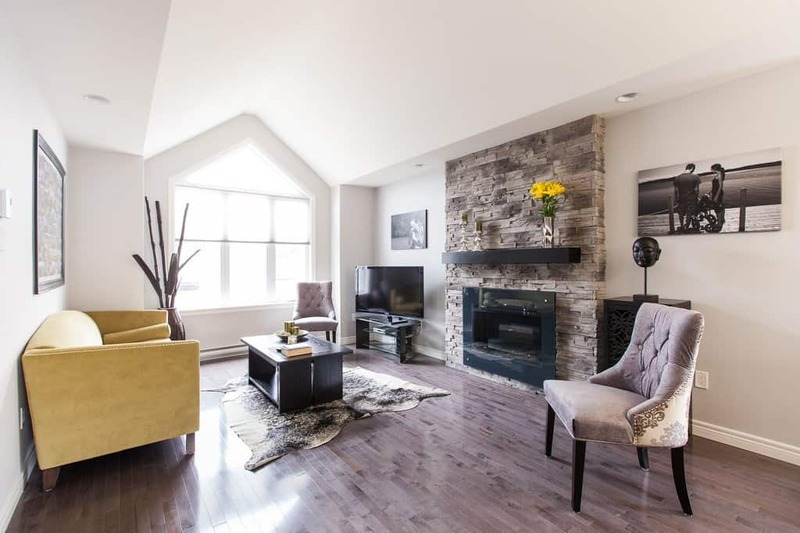 The coolness that exudes from the slate facade of this fireplace juxtaposes the warmth of the leather armchair and sofas, a perfectly harmonious blend that adds to the appeal of the all-white wall and ceiling. 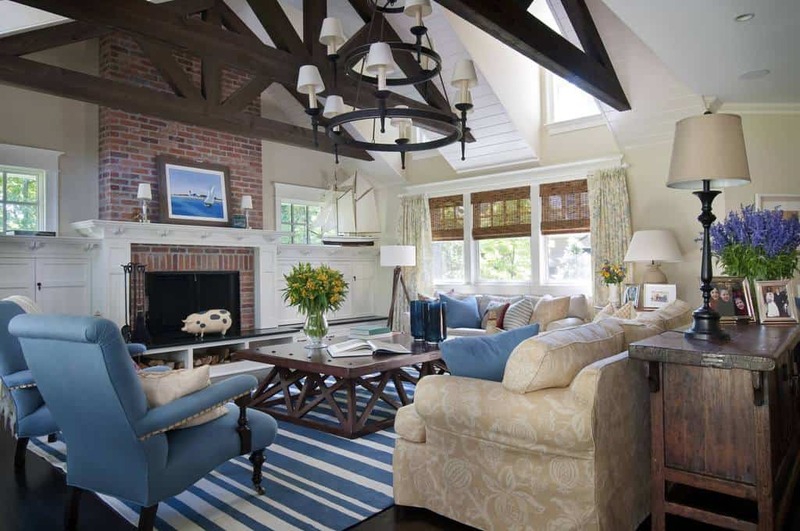 A vaulted ceiling adds dimension and visual interest to the ceiling of this already stylish and energetic interior. 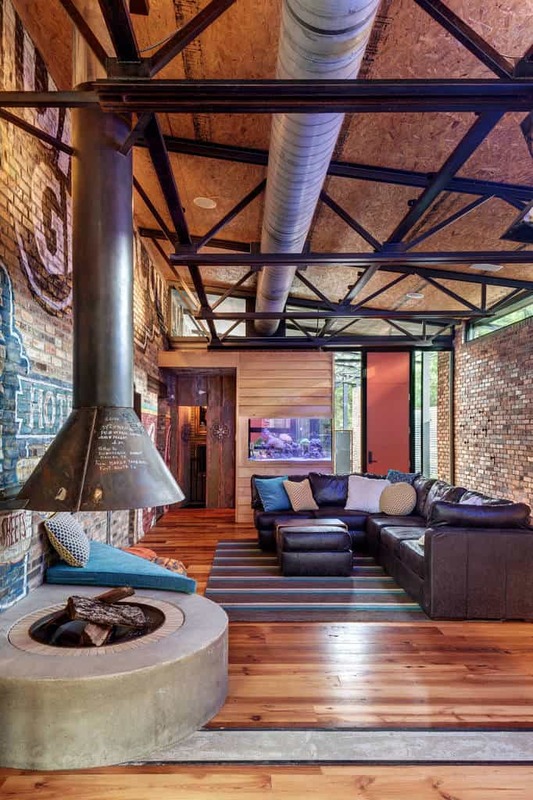 A mixture of Pop and Industrial prevail in this perky interior. 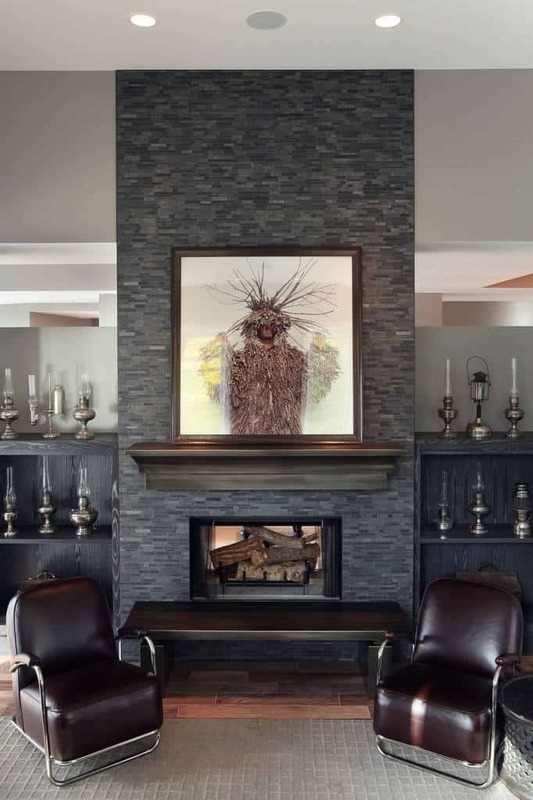 The modern metal fireplace serves as a functioning sculptural piece to the artsy, brick back wall. 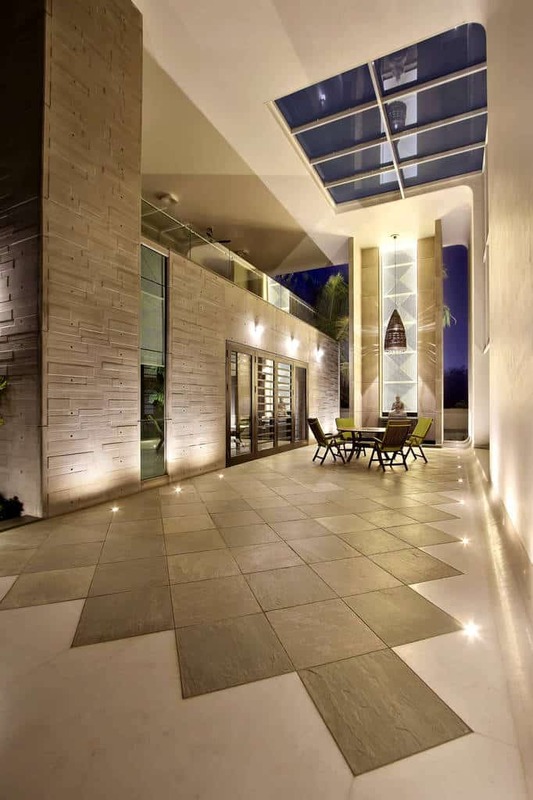 Illuminate your space through the installation of floor mounted uplights, seen here. This high-ceiling loft features a skylight and glass detailing. 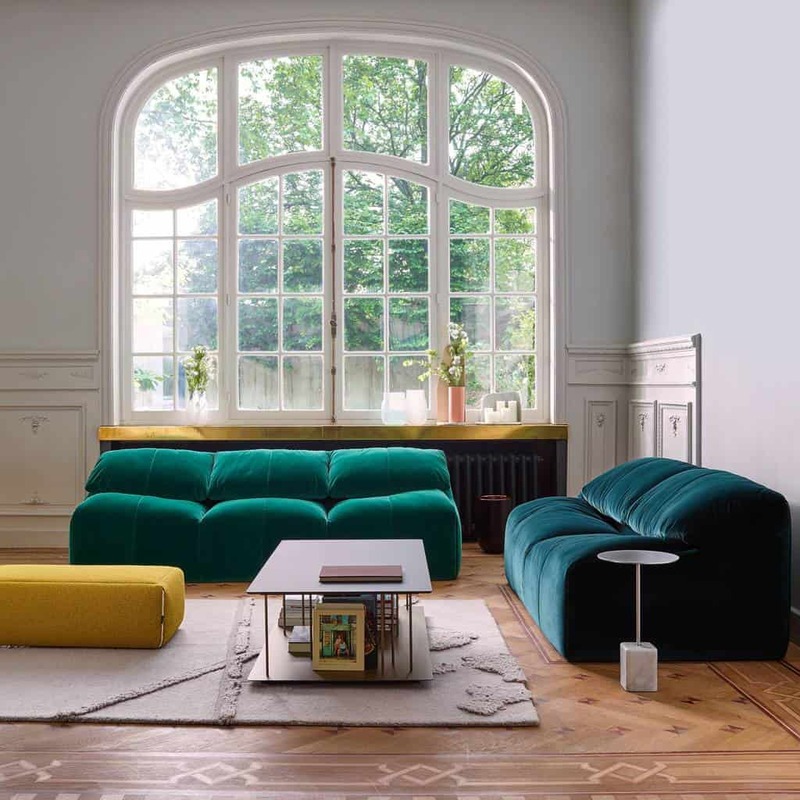 Modern green sofas in varying shade brighten up this well-lit residence. 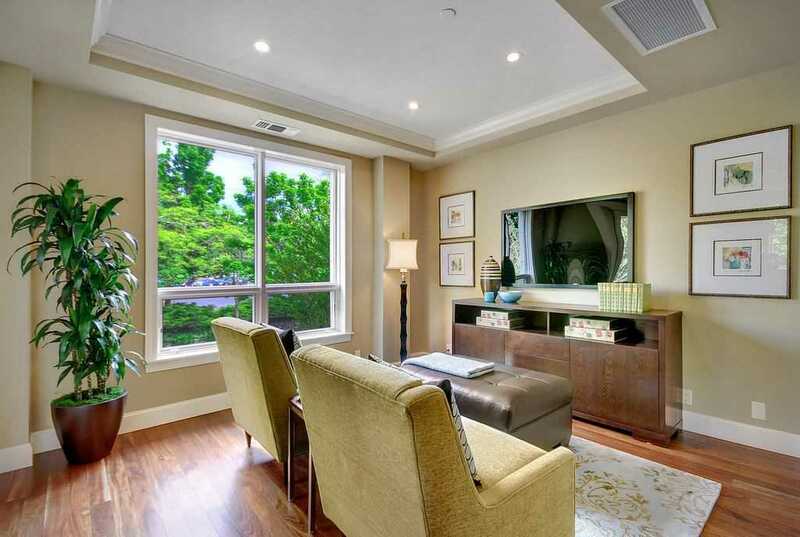 The big tall window gives off enough light to bounce off of its gold accent trim. 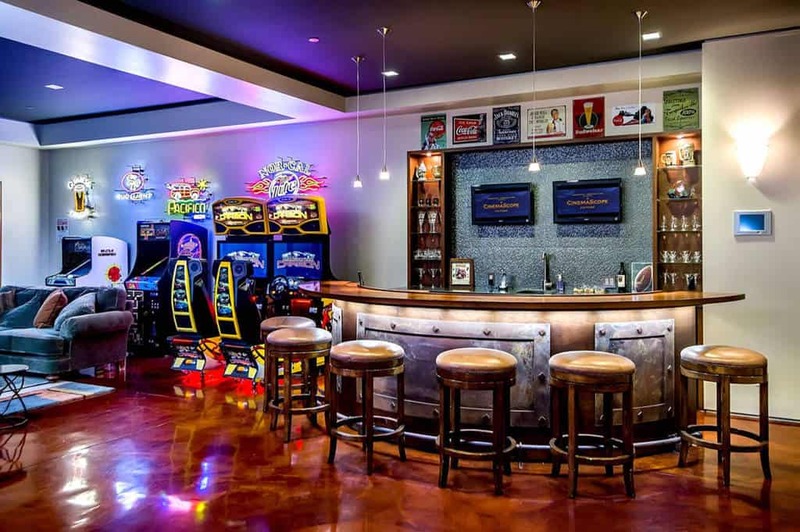 Your very own indoor amusement center will not be complete without a nearby bar which should be accessible all day along with some comfortable leather ottomans. 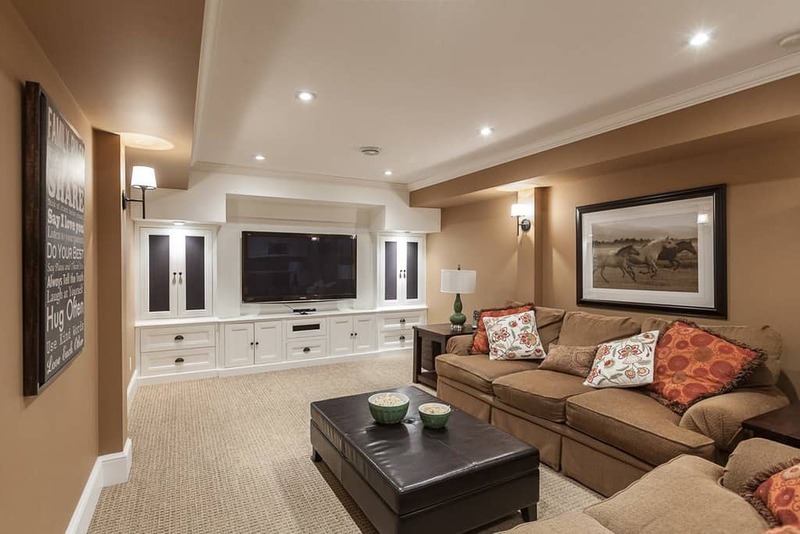 A modest example of an interior of an entertainment center with wooden sideboard, leather ottoman and a pair of fabric upholstered chairs. Very cash. 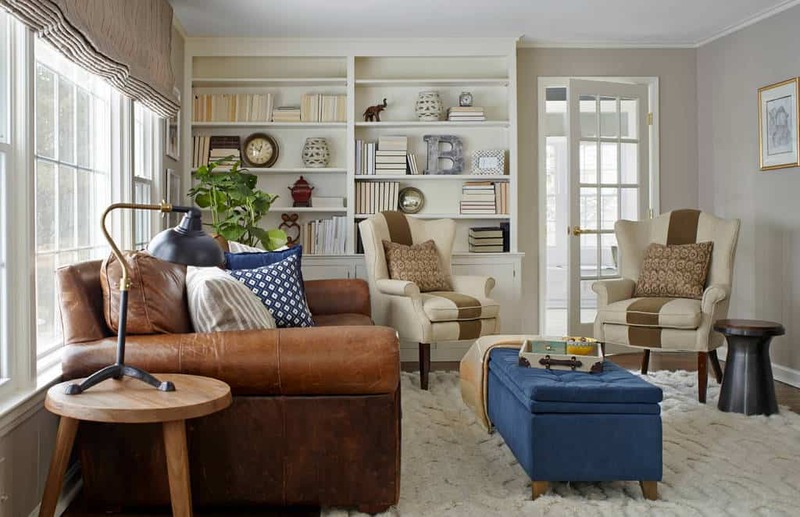 The blue upholstered ottoman is the finishing touch that the brown leather sofa and wingback armchairs in this room full of neutral colors are lacking. Chamfered corner wall acts as a focal point and also provides a natural source of light in this otherwise windowless foyer. Glossy finishes like clear glass coffee table, stainless metals, and lighted shelf display helps illuminate and add cheer to this minimal apartment. 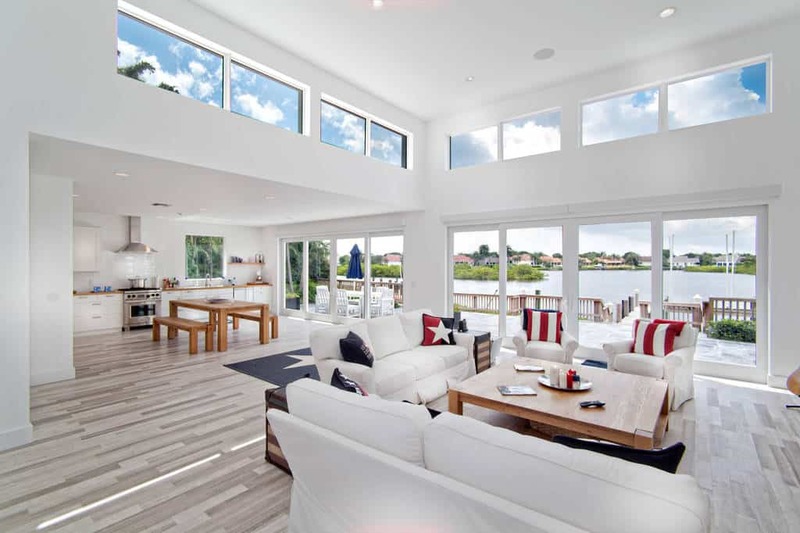 Patriotic accents of red and blue uplifts the spirit of this all-white, modern, and breezy house by the lake. 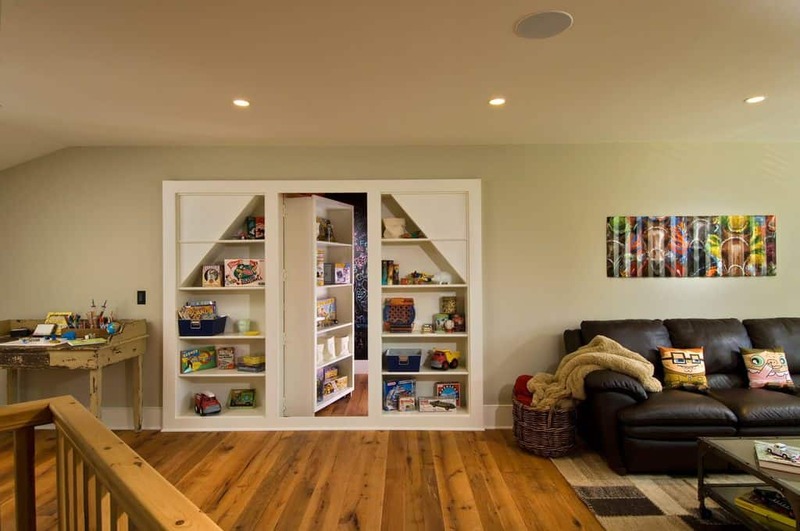 Hardwood floors, pale green wall paint, and white flat ceiling all help disguise a secret passage by the unassuming bookcase. 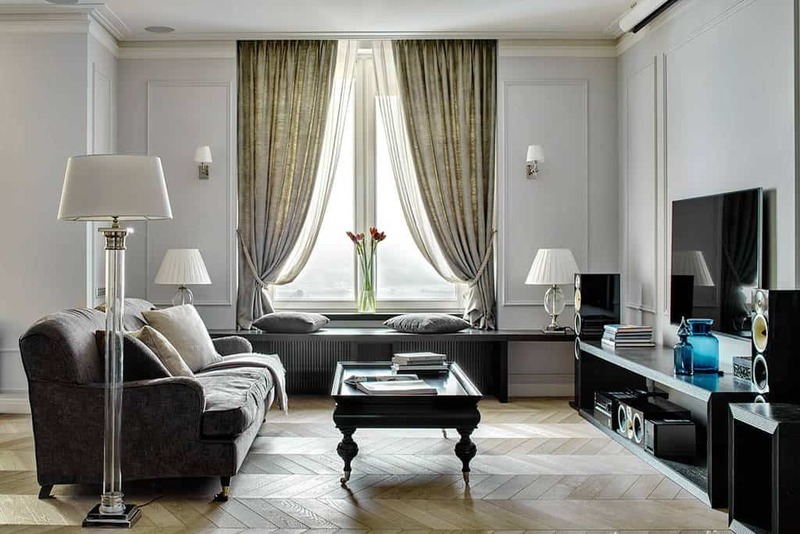 The herringbone pattern of the floor set the stage and help showcase the grey and black furniture and furnishing of the paneled interior of this pad.